Fily Bouaré Sissoko, Mali’s former Minister for Economy and Finance (2013-15), has joined the UEMOA Commission and was sworn in on 9 May 2017 for a four-year term. She is in charge of the Department of Business Development, Energy, Telecommunications and Tourism. Designated by President Ibrahim Boubacar Keïta (IBK), her appointment confirms long-standing rumours and marks the return of a senior Malian customs official to the UEMOA Commission. Sissoko is familiar with how the community institutions function since she was the President of the UEMOA Council of Ministers in 2013 and was the Governor of the ECOWAS Bank for Investment and Development (EBID). Before starting a career in the Malian administration, she worked as an economist at the World Bank’s office in Mali. 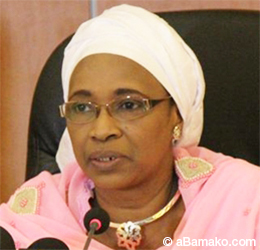 She then held several positions in Malian ministerial departments including in land affairs (2000-2002), communications and, eventually, economy and finance. She also has served as the Comptroller General of State and Deputy Executive Director of Customs. Born in 1955 in Dakar, Senegal, Sissoko holds an advanced degree (DEA) in development law, a master’s degree in economics, a certificate in customs techniques and a certificate in strategic planning and budgeting of public programmes. Sissoko’s new portfolio involves many roles: she will be responsible for developing the common industrial policy; advancing the Regional Initiative for Sustainable Energy (IRED); improving telecommunications and creating an enabling environment for the development of tourism and handicrafts.